Posted August 16, 2006 in 2006/08, 5 Studio, Archie, Odds & Ends, Periods, Topic, z Archive. 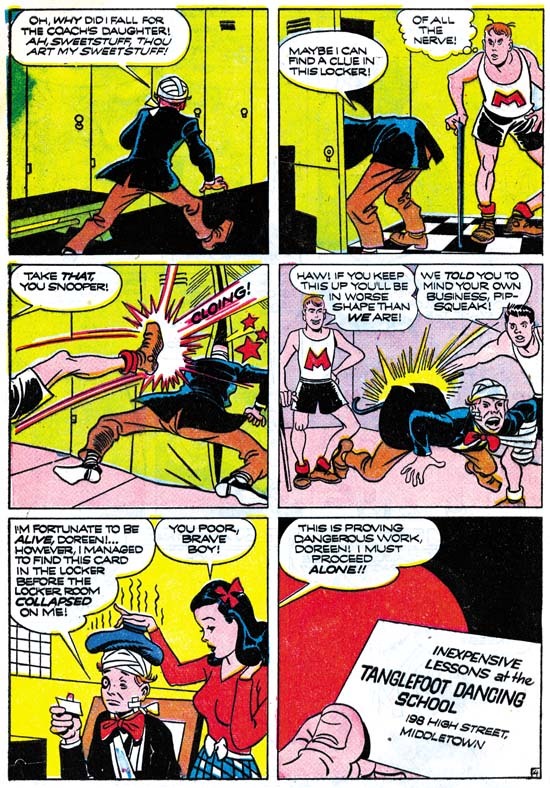 When Jack Kirby and Joe Simon returned from military service they tried to produce their own comics (Stuntman and Boy Explorers) with Harvey as the publisher. Unfortunately with the end of the war came the end of paper rationing. Publishers went wild and there was a flood of comics. This comic book glut meant that new titles, including those by Simon and Kirby, did not stand a chance. Joe and Jacks venture pretty much failed before it ever got to compete. S&K then tried a number of genre that were new for them. This includes some that are not the sort of thing one would normally associate with Simon and Kirby. One of their efforts was for a title called My Date for Hillman. Despite the title this was not a romance comic but rather teenage humor. It was essentially a take off of the very successful Archie. The humor is not just visual. There is some of the sort of silliness one expects in funnies directed at teenagers. The student Pipsy has opened an office at the school where students bring their problems to him to solve. The coach asks Pipsy to find out why the whole team has developed sore knees. Adding that if he cannot find the answer Pipsy can no longer date the coach’s daughter Doreen. Pipsy eventually finds out that the teams problems are due to Rumba Dumba dance lessons given by Doreen. She in turn says that if Pipsy reports this to the coach she will never date him again. More unusual I think is the slap stick that S&K bring to the story. Kirby was the master of action and violence which was not at all out of place for superheroes and kid gang comics. But I cannot think of any place where Jack used this talent to a greater extent in his comedy. The team member’s response to Pipsy’s prying are funny but actually quite rough. This story is so attuned to Jack’s strengths that I am sure that if the script was not actually written by Simon and Kirby, it was produced under their direction. Did Archie realize that Simon and Kirby’s rough humor in Pipsy did not fit well with the clean fun of the rest of the Archie comics? Or was it that Joe and Jack soon found success with crime and romance genre and felt no need to pursue such a limited feature as Pipsy? Whatever the reasons S&K would not return to do any more teenage humor stories for Archie. I do not know for sure, but I strongly suspect that Archie made no effort to produce further Pipsy adventures by themselves.